Each input signal is conditioned by scaling circuits which can be modified via on board multi-turn OFFSET, GAIN and BIAS potentiometers. 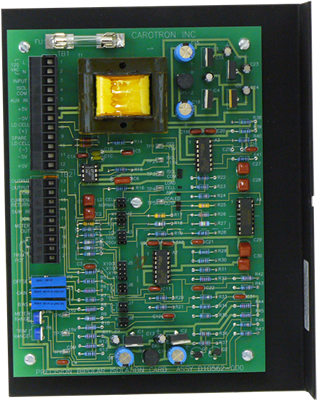 A multi-turn TARE potentiometer is also provided to zero out initial inputs when the card used as a load cell amplifier. Terminal strip connections are provided for a trim potentiometer. Also a METER RANGE adjustment is provided to limit the range of the meter output. The output circuit can be configured to source either a voltage or a current. Typical output ranges for the Bipolar Isolation Card are -10 to +10VDC, 0 to 20mADC.